In a few short years, it's believed that video content will make up an astonishing 82% of all web traffic. As a result, your company needs to shift its focus to a video-oriented content strategy to better engage your customers and stay ahead of the curve. While scripting and production are important, it's in the editing bay that your content will transform into the masterpiece you're looking for. But if you've never edited a video in your life, the process can be quite overwhelming. Not to worry, we're here to help make your post-production process as smooth as possible. Keep reading to learn how to edit videos like the professionals. 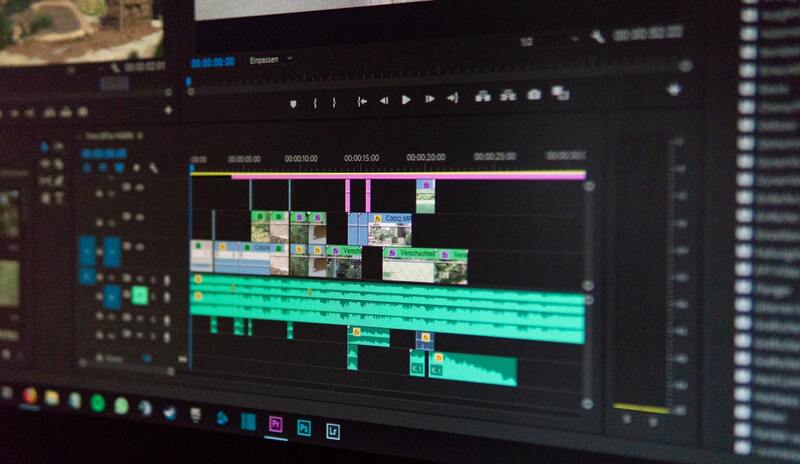 Should you head to a search engine and type in 'video editing software', you'll soon discover that you have quite a few options at your disposal. In all honesty, the biggest factor at play here is your hardware. If you're editing on a PC, you won't have access to Final Cut Pro but you will have access to just about every other type of software. This includes Adobe's Premiere Pro, which is currently the industry standard. Aside from hardware, most editing software options are quite similar, so it'll all come down to your preference. We do recommend that you try before you buy, though. Most companies allow either a week or month long trial so you can get a feel for whether a particular software is a good fit. Take it from us, video footage eats up a whole lot of data, so you'll want to head to your local computer store and buy an external hard drive with at least 2 TB of storage. Five minutes of HD footage will take up about 4 GB depending on the codec you choose. If you're importing 20 minutes of footage, that's 16 GB on footage alone. Exporting and encoding take up space, too, so you're already looking at around 25 to 30 GB for a several minute video. 4K is another beast entirely. Unedited 4K footage takes up 2 GB of space PER MINUTE! The good news is that most external drives will only set you back about $70. Since audio can be tricky to edit, be on the lookout for small distractions or odd distortions. These are far easier to spot when you're wearing a good pair of headphones. Go through each clip twice. The first time is a rudimentary exam where you'll determine if you should toss it or keep it. Then, play the clip again but close your eyes. If your audio has any issues, you should be able to hear them. If this is your first attempt at editing video, you may find yourself overwhelmed. You have multiple windows to sort through, menus to parse, codecs to select, libraries to set up, and clips to import. Phew. Even typing that out was stressful. Take a deep breath and reframe, so to speak. Post production is a lot like solving a puzzle. You're starting out with a ton of jumbled up pieces that, individually, make no sense. It's your job to take those pieces and make something coherent. Once you start to view it from that perspective, it becomes a lot less intimidating. No matter which professional video editing software you choose, learning keyboard shortcuts can streamline the process. Unfortunately, most software solutions don't make finding these shortcuts easier. Take some time to go through the tutorial or your software's online manual. Soon you'll be able to choose individual video frames, skip to your intro or outline in the timeline, and switch windows -- all without a single mouse click. If you're shooting on digital video, each second of footage contains usually 30 frames per second (technically 29.97) or a frame rate of 25. Believe it or not, those individual frames make a difference. Shaving even a second or two off of a clip can mean the difference between a jarring clip that takes your audience out of the experience and a professional-looking product. Imagine Halloween without John Carpenter's iconic theme. Or Psycho without the jarring violin screech during the infamous shower scene. Neither film would be nearly as powerful without these aural additions. Our point is that audio can be quite powerful when used well. So as you continue editing your video, remember to add a few sound effects and audio tracks beneath your footage to keep things interesting. The first thing you should do upon setting up your professional video editing software is to change how often the program saves or autosaves. After a full day of editing, a computer crash could wipe your progress and erase all your hard work. Most of the time you can change these settings from the software's preferences, though you'll want to consult your user manual for more details. Before you drag your first clip into your timeline, you'll want to log your footage. The logging process is simple, albeit time-consuming. The clip's purpose (walk-and-talk, establishing shot, etc.). Framing (close-up, extreme close-up, medium shot). Any abnormalities (loud refrigerator, botched line, etc.). Yes, it's a tedious part of the process. But when you're looking for that perfect clip you can easily sort through your library instead of having to click through each clip hoping it's the one you're after. There's a reason your favorite Hollywood blockbusters spend months in post-production. It takes hours and hours to edit video, so it's best to leave yourself with some breathing room. Always give yourself more time than you need for a project. That way you can go back and make any last-minute adjustments without missing your deadline. The post-production process can be a whole lot of fun. Yes, it takes hours of hard work and meticulous detailing that your audience may not even notice, but at the end of the day, you'll have a product worthy of your brand. So as you and your colleagues begin to shift towards video-based marketing, make sure you remember these tips on how to edit videos like a pro. Ready to get started? Check out these 10 online video editor tools to simplify your workflow and help you bring out your inner artist.